USDCHF has shown good jump of more than 100 pips in past three sessions from low of 0.98022. The pair was trading weak from Dec 26th till Jan 10th on account of global stock market turmoil. The slight easing of trade war between US and China and broad based US dollar buying is supporting USDCHF. The pair hits high of 0.99220 and is currently trading around 0.99211. 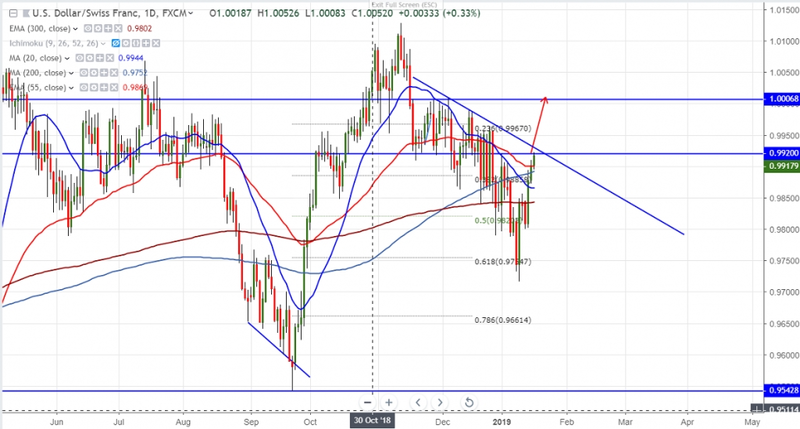 The near term major intraday resistance is around 0.9925 and any convincing break above targets 0.9965/1.0010/1.0068. Any break above 1.0130 confirms that pair has formed minor bottom at 0.97169. On the lower side, near term support is around 0.9840 and any violation below will drag the pair to next level till 0.9790/0.9735/0.9700. It is good to buy on dips around 0.900-05 with SL around 0.9860 for the TP of 1.000.